After riding the Saltern's Way down from Dell Quay we had a picnic lunch down on the foreshore at Itchenor watching the comings and goings. 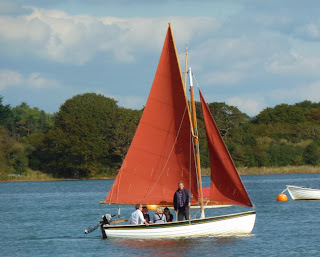 It was a fine day with more breeze than the various weather forecasts had predicted and a few traditionally rigged boats had taken the opportunity to get out on the water. Judging by the sail and the curved tiller the above looks like a Post Boat by Character Boats which is a modern GRP version of a Scottish type of sail and oar boat which delivered post around the sea lochs around Ullapool in the Scottish Highlands. 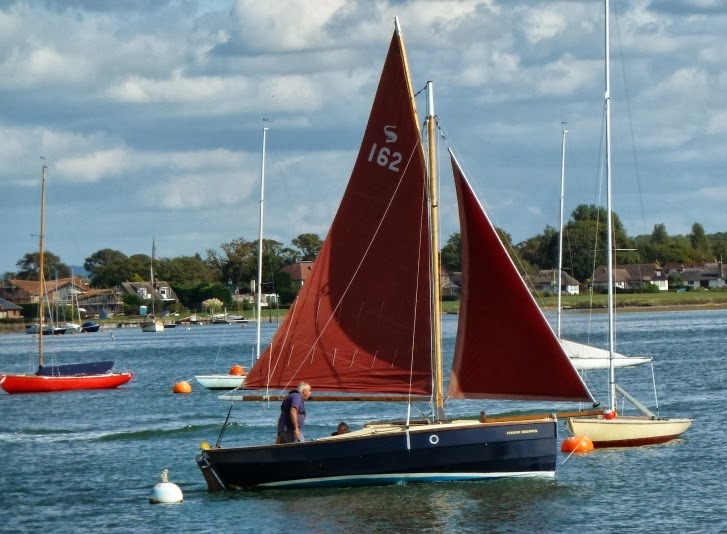 Probably the most popular modern gaffer in the UK if not the world is the Cornish Shrimper, there's quite a fleet in Chichester harbour and some of the sailing clubs have active racing. 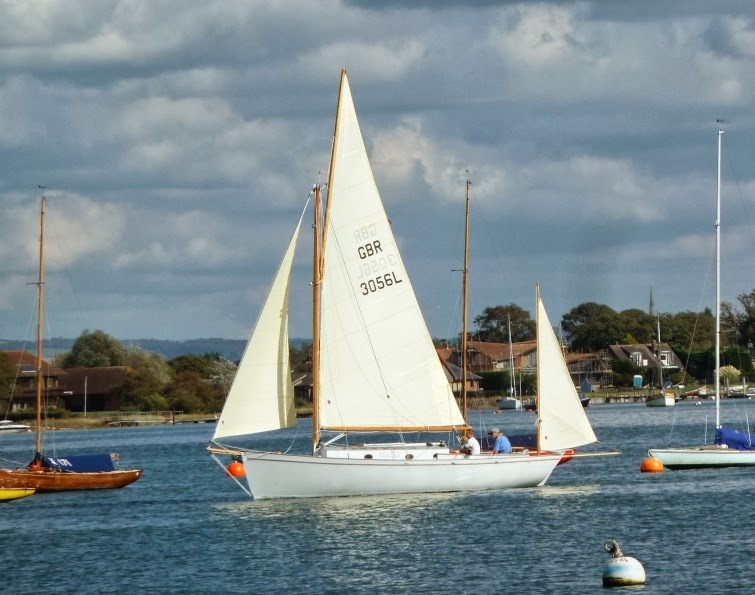 Effortlessly sailing up through the moorings it's easy to see the appeal of this good looking craft. 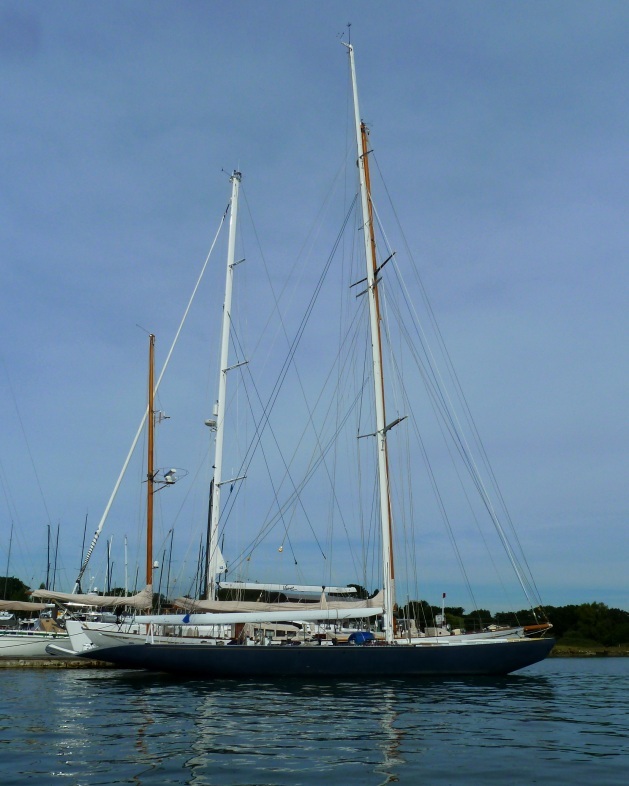 No information about this yawl, she looks to be modern. A lull between the rain was forecast for this morning so with the benefit of the clocks going back I took the opportunity for an early row down to Matilda Emilie with some extra fenders, warps and make sure everything was secure for the 80 knot winds which are coming through overnight. The worst of which is currently timed to coincide with high water on Monday morning. 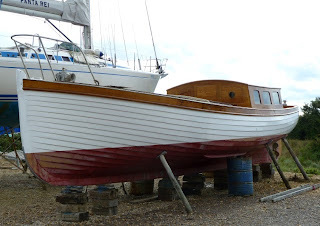 I set four massive fenders which were big when we used them on our 16 ton cutter Angelina, while they look a bit overkill on a 21 footer, there's now more fender than boat visible, hopefully they will keep Matila safely away from our neighbour, another First 210. Of course the lull in the showers didn't materialise so I got soaked and had the opportunity to test Gato Nego in some more nasty conditions. Going up wind she was really very comfortable, her flared sides throwing the spray aside. Coming back the wind was blowing straight up the river with the outgoing tide kicking up nasty standing waves, Gato coped really well, the only challenge was keeping her speed down to prevent risk of a broach. The picture doesn't really do justice but you can see the white caps in the open reach at the top right. 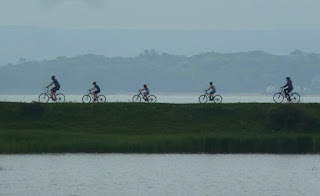 Wet and wild, but it was good to get out in the elements and blow away the cobwebs. 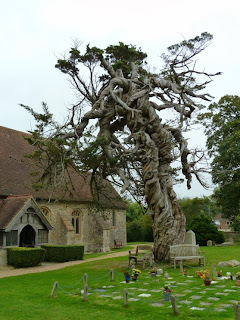 I've written previously about my fascination with the Yew tree, most often found in ancient church yards and in many cases pre-dating the Christian worship and marking the site as a place of pagan meeting. St James in Birdham by the shore of Chichester Harbour is no exception; there are no less than three yew trees around the church entrance including this magnificent specimen. St James church is no less interesting and equally ancient, the Nave is 14th century but the site dates back to 635BC, that’s getting on for 1400 years old, and well before the time that King Canute, one of our early Anglo Saxon kings was trying to hold back the tide at nearby Bosham. 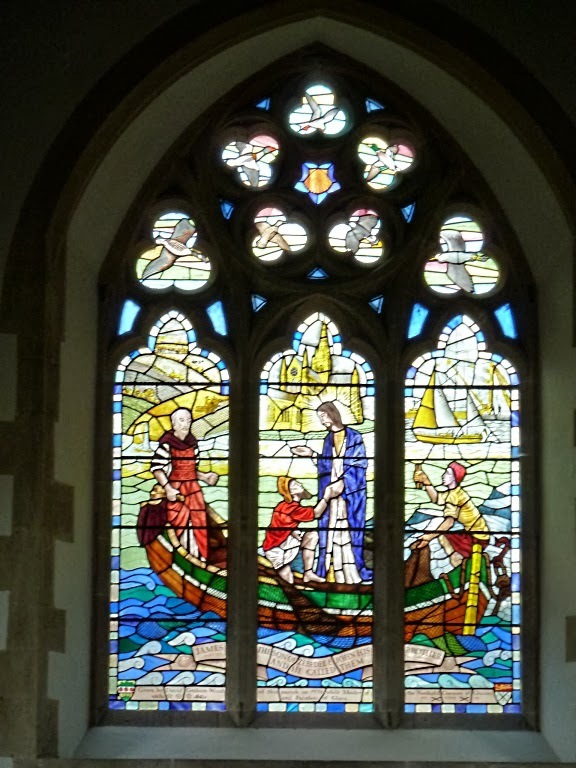 Not all of the church is quite so old, the stained glass was installed in 1978 and not without some humour, take a close look at the top right which features a modern centre cockpit ketch. 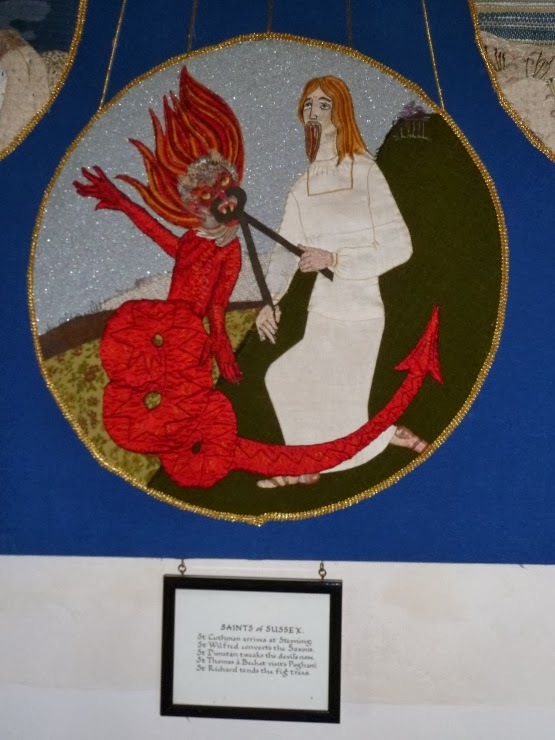 Quite a lot has happened over those 1400 years, this embroidery inside depicts various saintly acts, my favourite is St Dunstan who in the 10th Century famously pinched the devils nose with a red hot pair of blacksmith's tongs. We’re fortunate to have so many ancient churches locally which give a real and vivid connection back into our history. 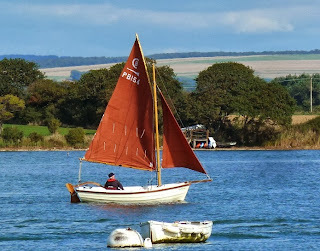 If you are interested I recommend fellow blogger Chris Partridge who when he’s not rowing visits and writes about Sussex churches. What to sail if you don't want a Laser. Could I be a Contender? 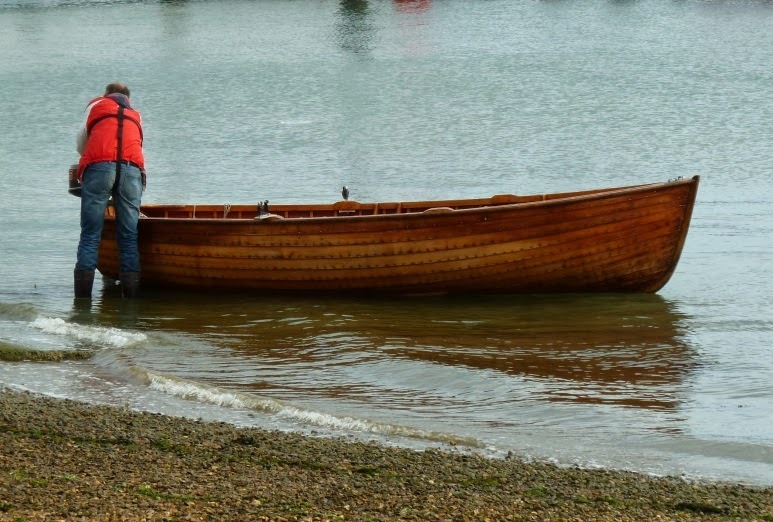 While having breakfast down on the quay the other day we watched this rather nice clinker built dinghy being launched. It looks to be around 16 feet and big in volume with high sheer and bows is clearly a very capable, stable, load carrier. 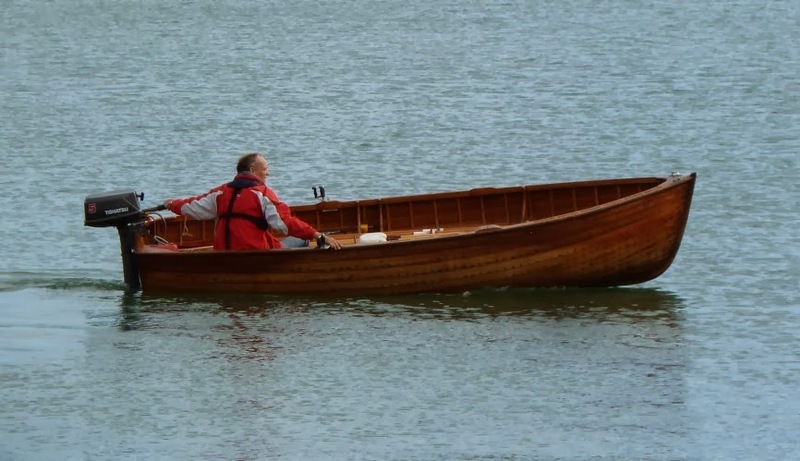 There are two rowing stations which would balance the crew load along the boats length. 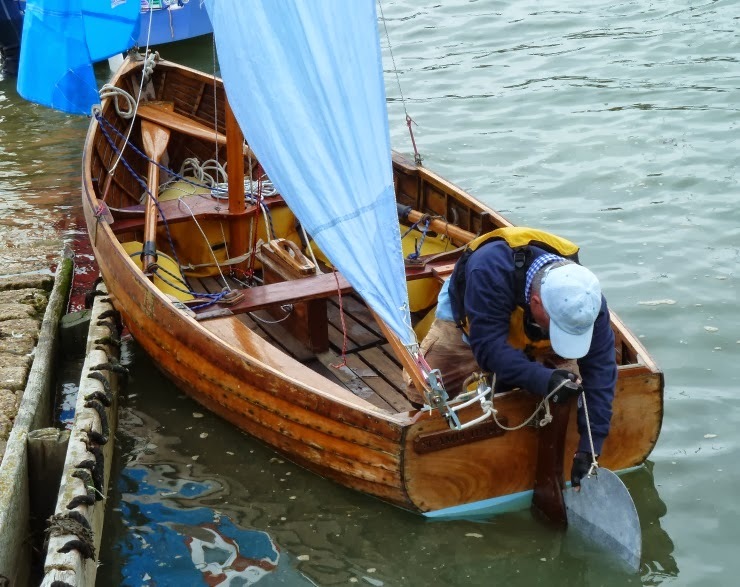 With the weight of an outboard on the transom a tiller extension would be a good idea moving the crew weight forward, bringing the bows down into the water. Hamble River Sailing Club was running another cadet sailing day recently, so we took Joseph and his friend along. 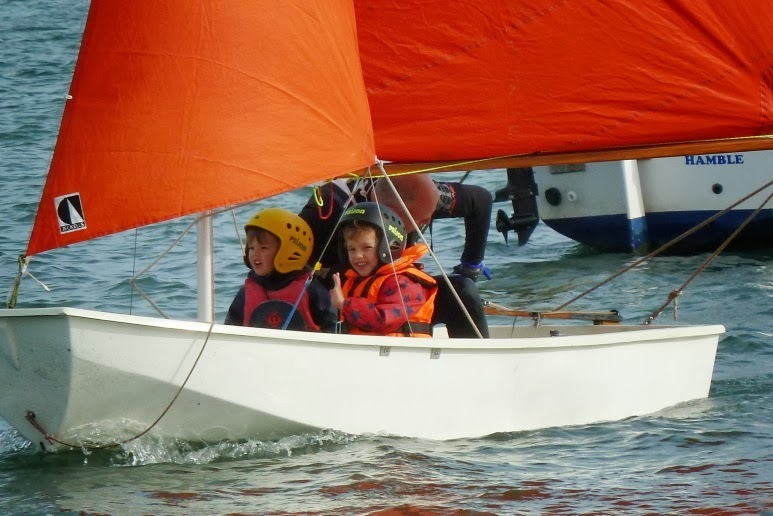 The boys spotted a bright yellow Pico and not surprisingly decided it was the boat for them. 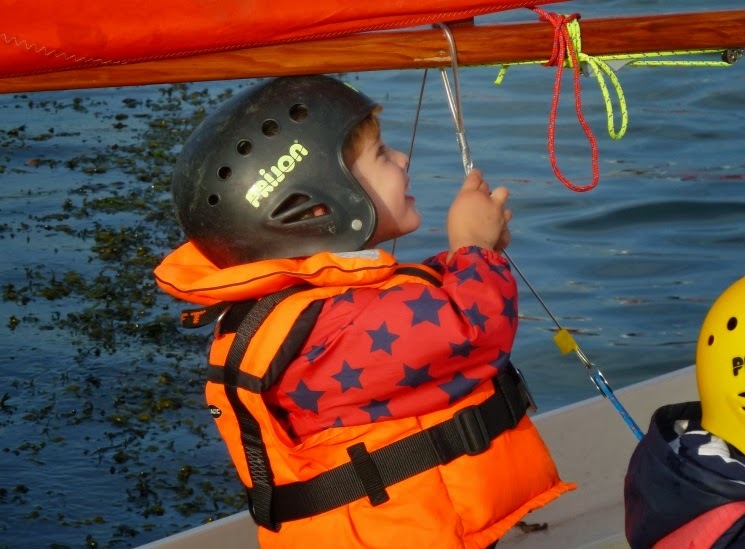 The day was a little gusty so prudence won out in favour of a Mirror dinghy, Mac their instructor quite rightly decided it was more a stable and suitable boat for two lively four year olds given the conditions. 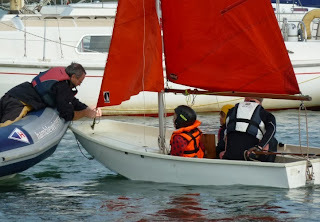 There was a quick stop for an impromptu repair to the foresail which had come detached at the tack, but soon fixed with a little help from the support boat. Atypically both boys seemed very content to sit still and watch the proceedings. 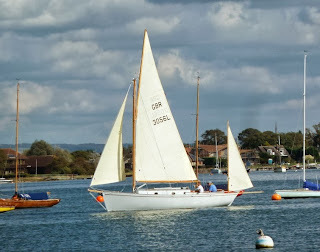 With the sail problem sorted they sailed off up river, with just a brief wave before leaving parents alone on the slipway. 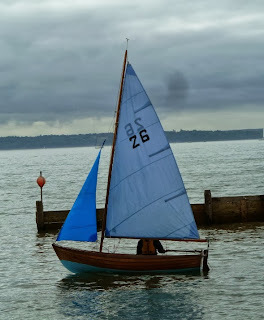 The mums went off to an afternoon tea event while we dads grabbed a cup of tea at the nearby café awaiting the intrepid sailors return. 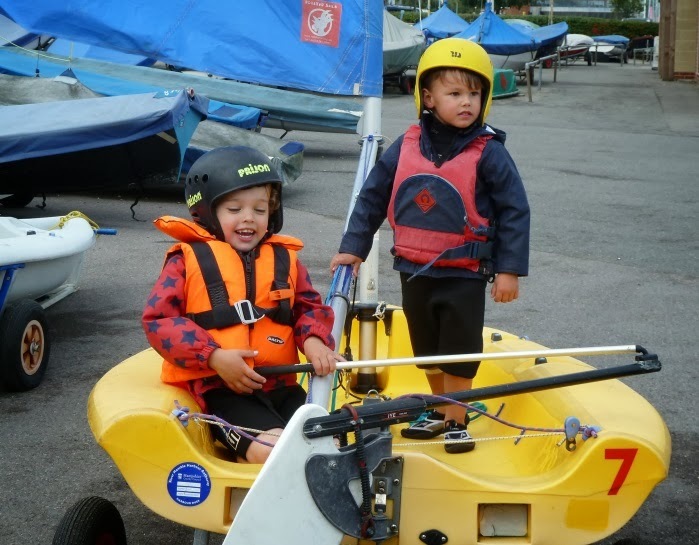 An hour or so later two happy boys returned smiling and happy and not the least concerned at having left their parents behind on the quay. 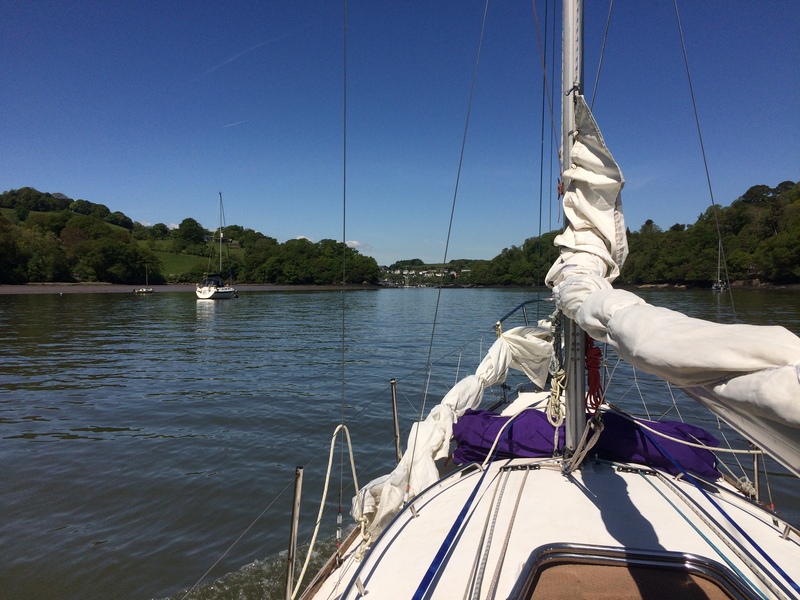 According to Mac they had sailed “all the way to Africa” and seen lions and tigers in the woods (hmm I’d better watch out when I’m out on my morning run). He was also amused that both the boys knew their respective teachers names although neither knew what school they attended, I guess two weeks in they maybe just forgot or were distracted by the lions and tigers. 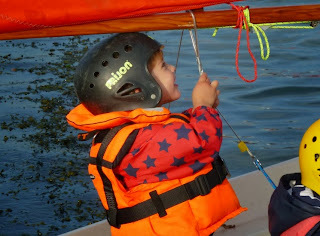 Joseph is clearly going to be a technical sailor, here inspecting the kicker for the correct tension perhaps. 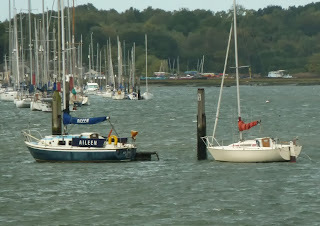 We still haven’t decided on a sailing club, Hamble River has a lot going for it. Like many clubs it has a good race training program for youngsters, but the club seems to just as happy to encourage the kids to get out on the water and have fun, which at the end of the day is what it’s all about. Another interesting find nosing around at the back of the boat yard over in Lymington. The lines are efficient and elegant, the fore deck was covered with what appears to be a later GRP addition, but that cabin is teak and quite lovely. No idea what her history is, sadly there was no one around to ask. 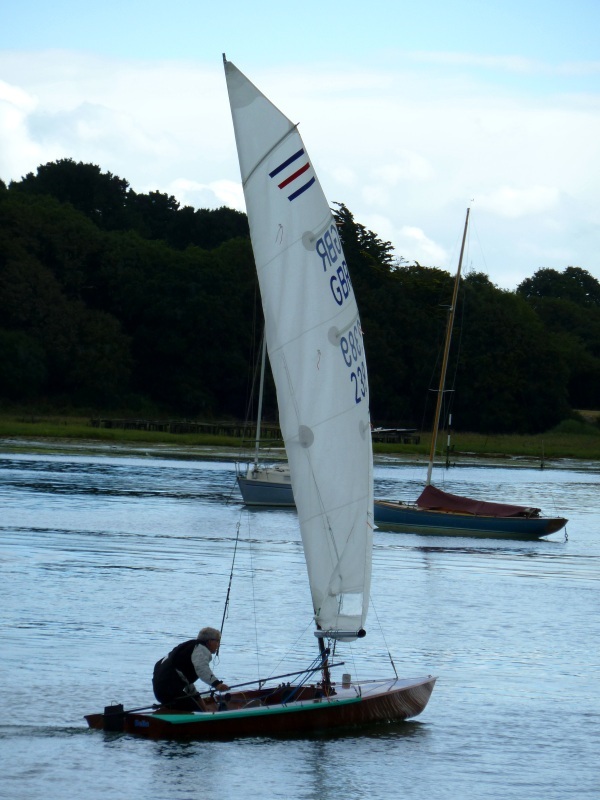 With the summer racing season winding down there were still a few interesting boats to be seen in the river. 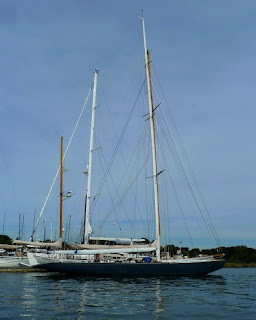 This looks to be a 12 meter, at a guess an ex America's cup entry. I wrote about the Jacqueline class dinghy a few months back, the design is native to nearby Hill Head and was adopted as a one design by members of the Hill Head sailing Club. 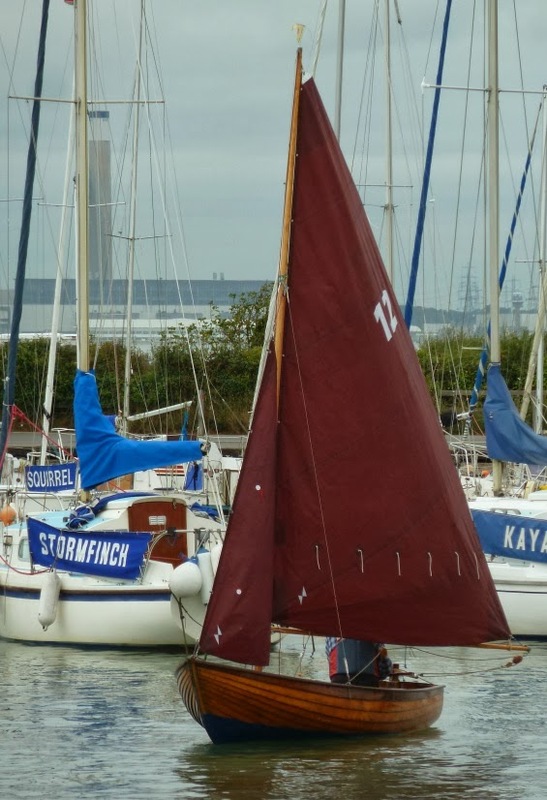 It was a bit of a surprise recently to see on the club fixtures that the class has it's own Autumn series. Not having seen the boats on the water we went off to have a look. 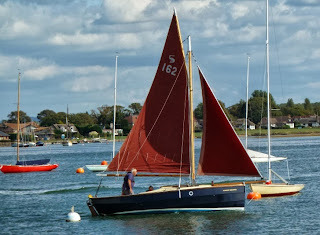 It was a pleasant but almost windless Sunday and sadly only two boats turned up, but it was great to see them close up. 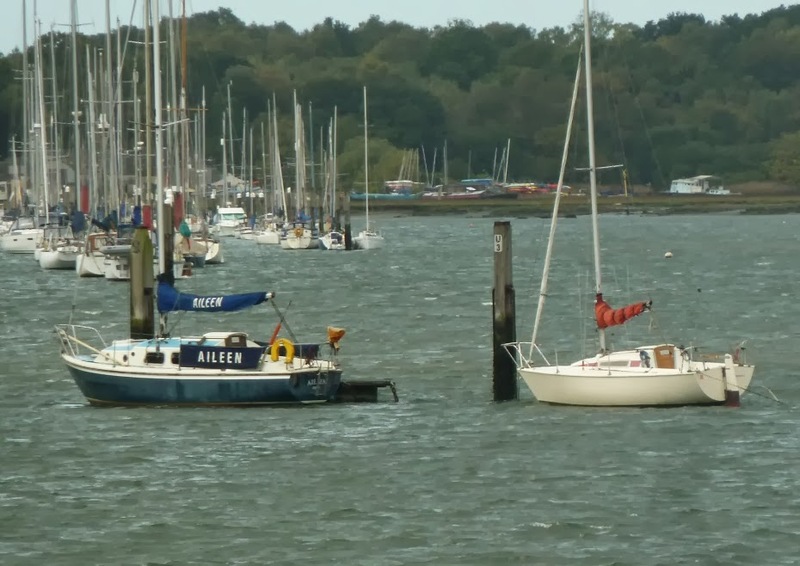 The picture above shows the high stem, apparently designed for the often choppy waters outside Hill Head the area is open to the Solent and the prevailing south westerly winds and can get quite lumpy at times. 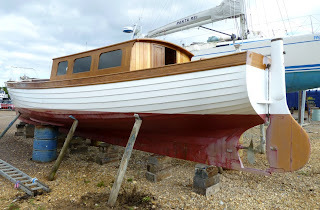 It also shows off the lovely clinker planking which absolutely shows off the hull shape a treat. 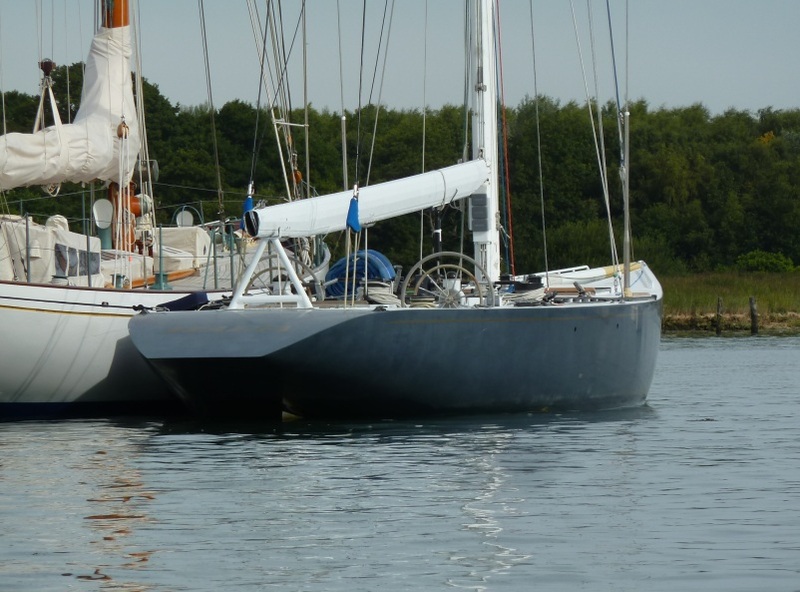 Interior is pretty much as you would expect, nicely fitted out, buoyancy bags, floor boards and something of a surprise it looks like a dagger board rather than a centre plate. 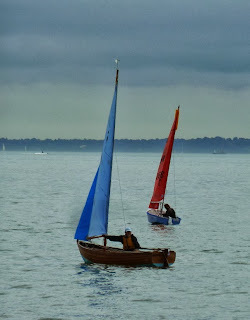 There was enough wind to get the very small fleet out of the harbour where the sails started to draw in the cleaner air. 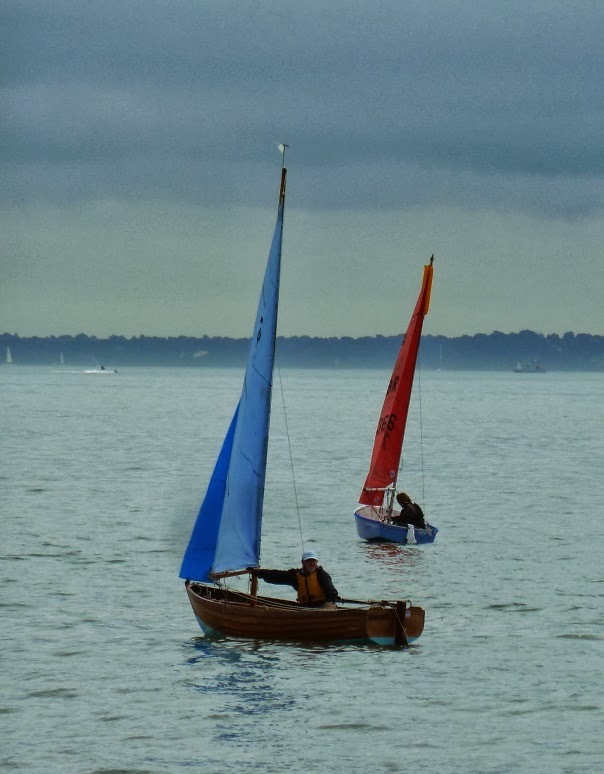 Great to see these boats out on the water.